2017 is a life-changing year... Are you prepared? Right now you're laying the foundation for the next 9 years of your life... choose carefully. We're at the first year of a nine year cycle. This means that, right now, you're not only laying the foundation for THIS year, but also for the ENTIRE nine year cycle. Think back to the beginning of 2008 - where was your focus? Can you see how the foundation you laid then played out over the last nine years? Do you have a plan to achieve transformation in 2017... and the next 9 years? If not, I do! Right now the energy is so supportive for leaving the past behind, having a breakthrough, and moving into a lasting period of Peace and Prosperity. NOW is the time to recalibrate and eliminate the habits and patterns that use up so much of your time, energy and $$$. If you'd like to transform your life in any way - here's a game plan for you to do just that - it works! Very helpful for added cognition and especially helpful if English is not your first language. You get FOUR classes - 75 minute audio mp3’s & the transcripts. A powerful class that’s jam-packed with helpful tools to clear the runway for your best year ever! 30 days of my Spiritual Counseling weekly calls to ask any follow up questions you’d like. If you can't be there live, you can submit your question ahead of time! This is REAL support! 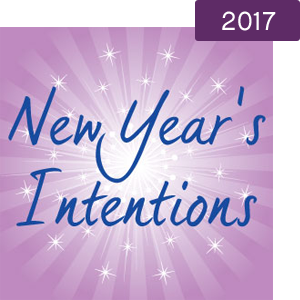 Participants consistently tell me that if they hold their new intentions in their heart and nurture them to fruition, they make a profound difference in the quality of their year. Take the conscious steps to make this 9-year cycle miraculous for you! Q.HOW IS THIS CLASS DIFFERENT THAN OTHER INTENTION COURSES? A.Discover how to anchor yourself with intentions year-round so you can experience greater clarity, strength of heart and fulfillment every day. A.If you’re not satisfied by the course after 14 days, you can request a full refund. We will ask to see the coursework you’ve completed to be sure that you’ve been following along with the program. Learning is a two-way street, after all! Q.DO YOU OFFER PAYMENT PLANS? A.I would like everyone to be able to take this course. If you are unable to afford the class in one payment, send us an email at admin@jenniferhadley.com. We will work with you to come up with a plan that supports you. Q.HOW MUCH DOES NEW YEAR'S INTENTIONS COST? A.You pay $155 for FOUR – 75 minute mp3 audio classes. You can attend live, listen to the replay online, or download the audio. A transcript for each class will be available. CLICK HERE to start the class now! If after taking this class, you would like to join the full Masterful Living Year-Long Course, it is $127 per month for 12 months. You can cancel at any time. Q.IT'S ALMOST FEBRUARY. IS IT TOO LATE TO GET STARTED? A.Not at all! Even if you tried a different resolution that is now waning, there is still time to set a strong foundation and reset your year… and the next 9 years.